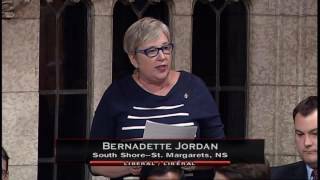 I was proud to rise in the House to talk about the great things found in Budget 2018 for all of us on the South Shore. First, the commitment of $250 million in funding for Small Craft Harbours. 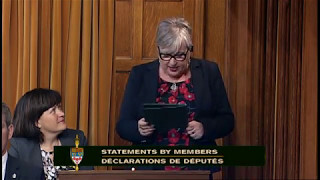 The second thing I'd like to highlight that's not only good for our riding, but for Atlantic Canada, is the funding dedicated to protecting our forests against spruce budworm. Lastly, I wanted to highlight something called the Canada Workers Benefit. Basically, this benefit is an enhanced version of the Working Income Tax Benefit, which supplements the earnings of low-income earners. 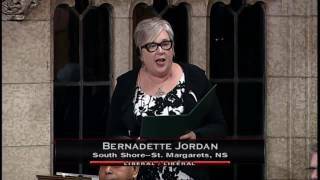 Added April 3, 2018 from Bernadette Jordan. I had a great exchange this morning with my friend and colleague, Honourable Minister of Fisheries Dominic LeBlanc. I had the opportunity to ask him about how Small Craft Harbour funding will be allocated, the process for removing larger abandonded vessels, and if he could provide any information or update on DFO enforcement on the ground - we have a long coast line here on the South Shore, and we want to make sure our harbours and communities are safe and secure. 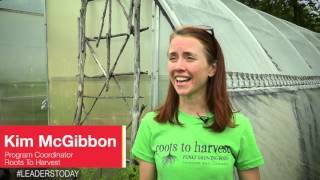 Traveling around the South Shore last summer and visiting students who were making new friends, learning new skills, and excelling in the Canada Summer Jobs program was a definite highlight! I would highly encourage organizations in our communities to apply for the program, and offer our young folks an invaluable opportunity. 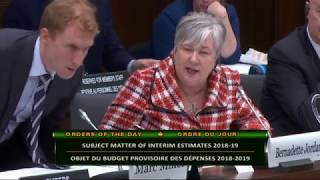 I was honoured to rise and ask a question to the Parliamentary Secretary to the Minister of Transport, Karen McCrimmon, about an issue that is very important to me and to South Shore-St. Margaret's: abandoned and derelict vessels. I am pleased to know that our government has launched the Abandoned Boats Program, which provides grant and contribution funding to assist in the removal of abandoned and/or wrecked small boats posing a hazard in Canadian waters. I am proud that our government is taking abandoned and derelict vessels seriously and that we are working on resolving this key issue. 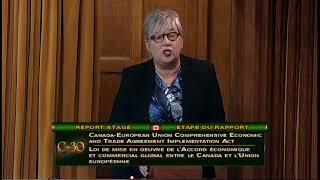 I was delighted to speak on the Canada-European Union Comprehensive Economic and Trade Agreement (CETA). This is an ambitious trade agreement that results in 98% of tariff lines between Canada and the EU being duty free, Canadians having access to a market of more than 500 million consumers, and will allow for more choice and lower prices! 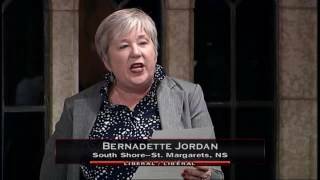 Added May 9, 2017 from Bernadette Jordan. 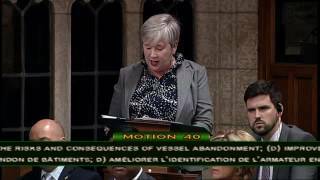 I rose in the House to ask the Minister of Transport what progress has been made on my motion, M-40, regarding abandoned and derelict vessels. Thank you to the Honourable Minister for his reply. It is with a heavy heart I stood in the House to inform my colleagues of the passing of Dr. and Mrs. Dave and Heather Abriel. To their children, family, and loved ones - your community grieves with you. 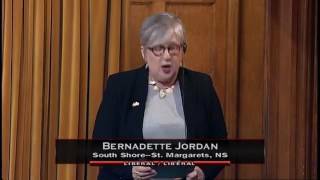 It is always a pleasure to rise in the House and inform my colleagues of the great work our local businesses in South Shore-St. Margaret's do! Congratulations to Iron Works Distillery in Lunenburg for winning 5 medals at the International Distillers Competition in Germany - job well done! 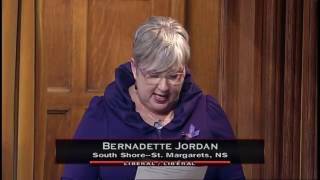 I was pleased to rise in the House and offer my support to those not only in South Shore-St. Margaret's, but across the country who have epilepsy. I would encourage you to go to epilepsy.ca for more information. Added May 8, 2017 from Bernadette Jordan. 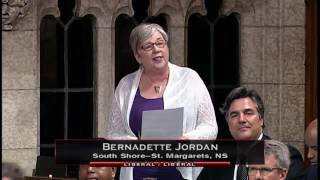 I was very happy to rise in the House on May 2 to commend the incredible constituents of South Shore-St. Margaret's for running in the Boston Marathon. Congratulations to Chris Anderson for completing his 29th consecutive Boston Marathon, and to all those that ran! 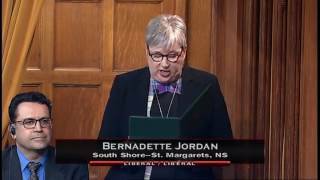 Added February 7, 2017 from Bernadette Jordan. Adam Graves of Brookside, Nova Scotia, spearheaded an effort to raise almost $2000 and distribute 175 gift bags and Christmas gifts to people in vulnerable situations across Halifax at the beginning of this winter. He was supported by Hope Cottage in Halifax. Added December 14, 2016 from Bernadette Jordan. This week I was able to recognize the heroic actions of Eric Nickerson, Trevor Munroe, and their fellow coastguard members, when they responded to a distress signal 50 miles offshore. Take a listen. I would also like to again wish everyone who works on the water a safe a prosperous season. 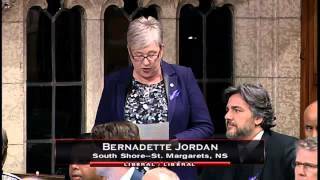 Added November 15, 2016 from Bernadette Jordan. 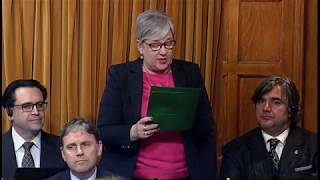 I was very happy to rise in the House of Commons to recognize the courageous work of the firefighters in our region for their work during our extremely dry summer. THANK YOU for your work battling this summer's forest fires to keep our families and communities safe. Also extending a big thanks to the many volunteers supporting our firefighters! 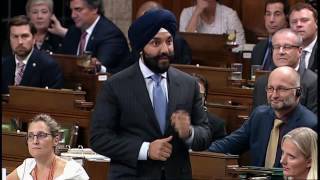 I asked the Navdeep Bains, Minister of Innovation, Science and Economic Development, to please explain how the work of the Atlantic Growth Strategy is different will be different than the work that has previously been done to address the problems of economic growth in Atlantic Canada. 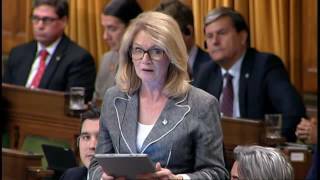 On October 24 we had the last hour of debate in the House of Commons for my motion, M-40. We heard from 2 members of each of the major parties, with everyone speaking in favour of my motion! At the end of the debate, I had 5 minutes for my right of reply. 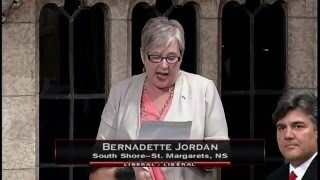 I had the opportunity to recognize a talented young woman from our riding. MacKenzie Corkum is the first cadet in the history of the 2688 Kinsman army cadets to make the national rifle team, which will be competing in England next summer. Join me in congratulating MacKenzie as she continues to make her mark in this historically male-dominated field! 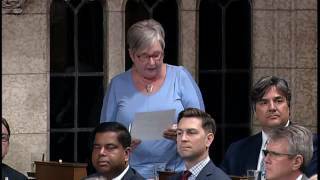 Kate Young, the Parliamentary Secretary to the Minister of Transport, responded to a question about abandoned and derelict vessels and reaffirmed the Government's support for my private members' motion which seeks to address this issue. 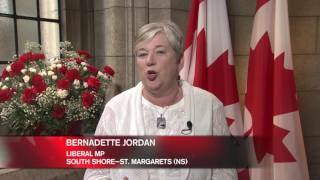 Added August 10, 2016 from Bernadette Jordan. 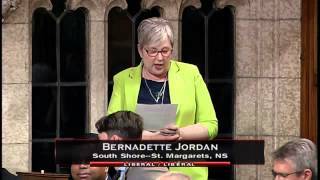 Bernadette Jordan, Canadian MP for South Shore - St. Margaret's, speaks in the House of Commons offering congratulations to local young curlers Mary Fay, Kristin Clarke, Karlee Burgess, Janique LeBlanc, and Sarah Daniels for their victory at the World Junior Curling Championships in Denmark in March 2016. Just over two weeks ago I had the pleasure of checking out some amazing science fair projects by kids in our community. Canada needs innovative thinkers of all ages, so it was very encouraging to see the interesting ideas and concepts studied by our students. Yesterday in the house, I had the opportunity to recognize the hard work of those students (and their supporters), and extend our congratulations to those who are moving on to the national science fair in Montreal! Our coastlines are a source of pride and economic opportunity for many Canadians, and we must ensure that we do everything possible to safeguard them and the livelihoods which are dependent on our coasts. Abandoned and derelict vessels create an economic burden on communities, and limit the potential of our waterways and harbours. The concerns I heard from many residents are what lead me to developing my Private Members Motion, M-40, in which the House calls on the Government to take action on this issue. 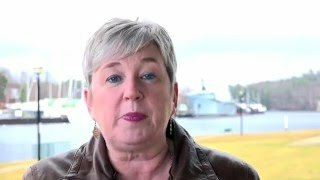 Please share this video, and help me raise awareness about an issue which affects communities across Canada. 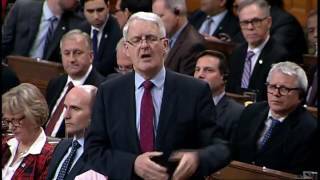 M-40 will be first debated in the House of Commons on June 3, and I look forward to building support from across the country. 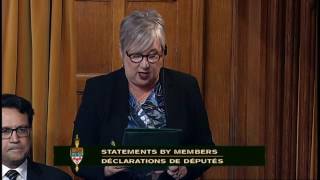 Yesterday I had the opportunity to ask the Minister of Transportation, the Honourable Marc Garneau, to provide the House with an update on the recent developments with the Port of Liverpool. 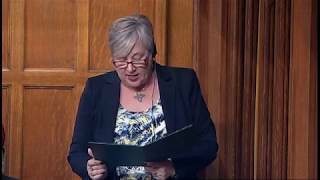 I was thrilled to rise in the House of Commons yesterday to recognize the World renowned Liverpool International Theatre Festival. Kudos to the many, many volunteers who make this festival such a success, and a huge congratulations to the Artistic Director Eva Moore on a fantastic 26 years and a successful final show.